Doctor Who: The Moffat Scripts – THE MAGICIAN’S APPRENTICE / THE WITCH’S FAMILIAR | Warped Factor - Words in the Key of Geek. Dr. Moo looks at the explosive series nine opener, dude. My initial response to seeing these two episodes back in the autumn of 2015: Now THAT’S how you open a season! The story kicks off with one of those pre-credits sequences that will forever rest in the mind of all who see it. Hand mines, the war with mixed levels of technical machinery, a boy running the wrong way. All standard fare here or at least nothing new. Then the Doctor appears. He’s lost the seriousness we grew used to since last we saw him, with his hair going crazy and his clothing more casual. That’s a good thing in my book. He throws his sonic screwdriver to the boy and shouts encouragements at him promising to help. But then the boy says his name. This boy is the creator of the Daleks. This boy is the Doctor’s greatest enemy. Davros as a boy! The Doctor refusing to help an innocent person, a child even! That’s an ambitious start to any story but to kick off the new season like that? The days of “Judoon platoon upon the Moon” are long behind us! Just as well really. Of course there are still elements of the great Russell ‘The’ Davies present in the story, such as the way we learn all the planes have stopped via a montage of news bulletins. We get a quick visit to the Shadow Proclamation last seen in The Stolen Earth, from which a clip of the Tenth Doctor speaking to Davros is briefly used. Other previous Doctors also show up talking to him as well, as the Fourth, Fifth, Sixth and Seventh make appearances. Always nice to see the classic Doctors show up in ‘NewWho’ and even better if the immortal line “UNLIMITED RICE PUDDING” if used. Yep, this is a Davros story. We haven’t had one since the overly long fanwank of The Stolen Earth / Journey’s End back in 2008 so his return is welcome. Equally welcome is the return of Julian Bleach to the role, the only Davros actor to rival Michael Wisher’s original, and he gets some great moments here. Part of that is, I suspect, because of Moffat’s desire to effectively lock him and the Doctor in a room together and see what happens. 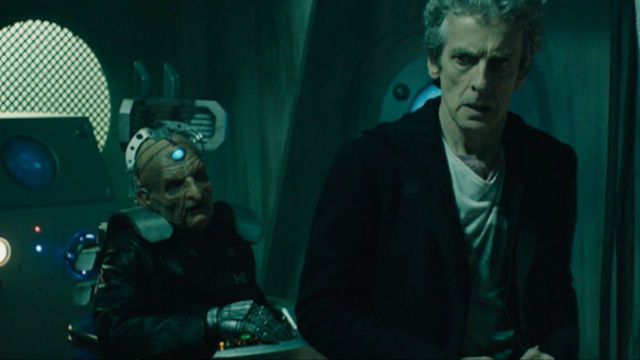 He said that when he was preparing his storyline prior to writing the script that he went and watched all the previous Davros stories and concluded that the best scenes were those of the Doctor and Davros talking one-on-one. As such he has most of the second episode spent with the two of them musing on their philosophies and comparing their similarities and differences. Capaldi and Bleach are utterly brilliant here with both ‘acting’ acting opposite each other. This time we see Davros as a sympathetic character, an old man on the verge of death, who just wants to see one last sunrise over his home. This is a masterful bit of writing that takes us right to the heart of Davros, not the evil villain beyond redemption but as the Kaled scientist who only wants to ensure his race’s survival before he ever conceived of the Daleks. These scenes are among the best in the whole of the revived series thematically, and in the writing and acting. That really is the meat of this story, the character study of the Twelfth Doctor and his similarities to the creator of his greatest foes. It’s this theme that makes it such a great story. Everything else is just “window dressing”. But what wonderful “window dressing” this is! 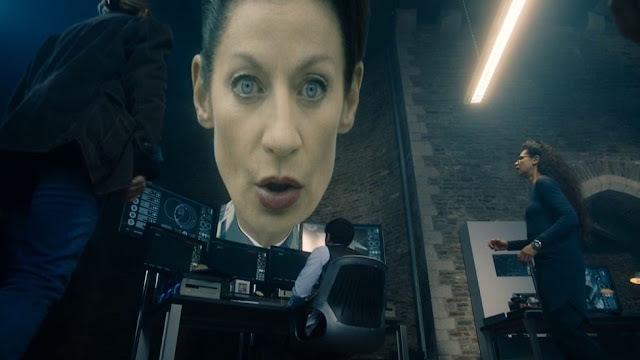 Michelle Gomez back as the Master, so soon after her apparent death at the hands of (for better or worse) the CyberBrig. There’s not really much of a purpose to having her in this story but she’s so brilliant that you forget all about that. She deserved that BAFTA nomination (but where in the everloving f**k was Capaldi’s?!?!?!?!?!?!?!) for her portrayal of the Master as a deliciously bonkers maniac. She’s pure evil, picking off UNIT soldiers like a child at a pik’n’mix stand, but also a complete nutjob. 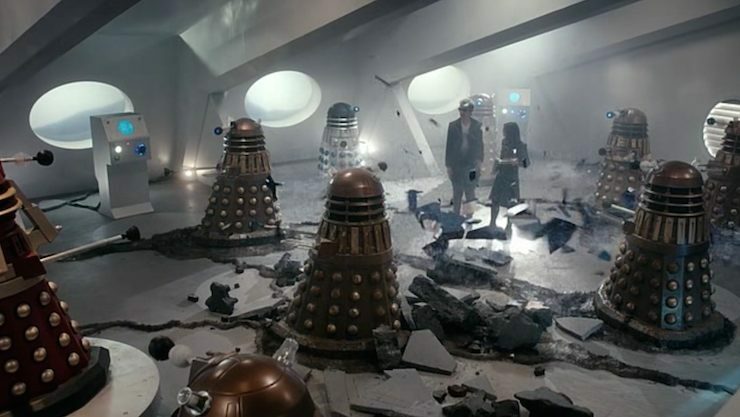 Singing a high-pitched warble as a spaceship flies her, Clara and the Doctor to Skaro before threatening to kill Clara. Later, there’s the bit where she strings Clara upside down, the bit where she drops Clara down a hole to test its depth and then there are the Dalek Sewers lifted straight out of The Curse Of Fatal Death. At one point she kills a Dalek – as it explodes she’s going “WHEEEEE!” and if there’s a moment that sums up how mental her take on the Master is then this is it – and then she traps Clara inside the Dalek casing and tries to convince the Doctor to kill her, showing she’s still the cool hard sociopath Roger Delgado introduced us to. In fact the Daleks are at their best here. This story offers some pure undiluted fan service with them by featuring every major design there’s ever been since 1963, save for the distinct absence of the New Dalek Paradigm because most fans hated them (I still want to know what the Eternal Dalek was meant to be), with even the “abomination” that we call the Special Weapons Dalek making an appearance. That’s not to say that The Magician's Apprentice & The Witch's Familar make up a perfect story. What exactly are UNIT doing in it? Why is Kate Stewart less capable than an implied-to-be-bisexual English teacher? The entire story sees the Daleks doing very little. There’s that bit when they shoot the Master and Clara dead and destroy the TARDIS only for it to turn out that they didn’t succeed at any of these things. Then they just sit around for the next fifty minutes or so. And is there any reason why the classic Daleks are used for this story beyond the fan service this offers? 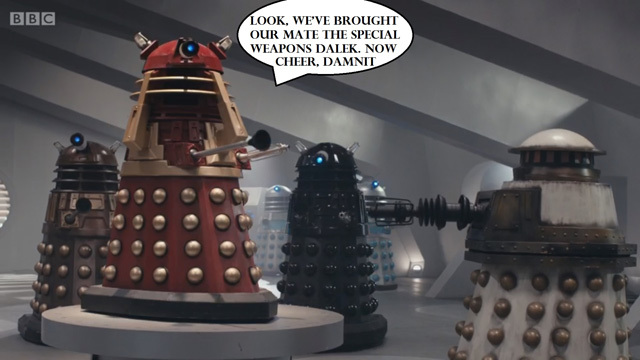 The inclusion of the Special Weapons Dalek is especially redundant given that it does little more than sit in the corner to satisfy the demands of some fans for it to come back. It doesn’t even shoot anything! These issues are minor however when compared to the many positives. I’ve barely mentioned some of the best bits like the Doctor riding in on a tank while playing the Doctor Who theme on electric guitar, or the incredible performance of young Joey Price as the child Davros (I’ve said it before and I’ll say it again, he’s going places – if he keeps acting that is). 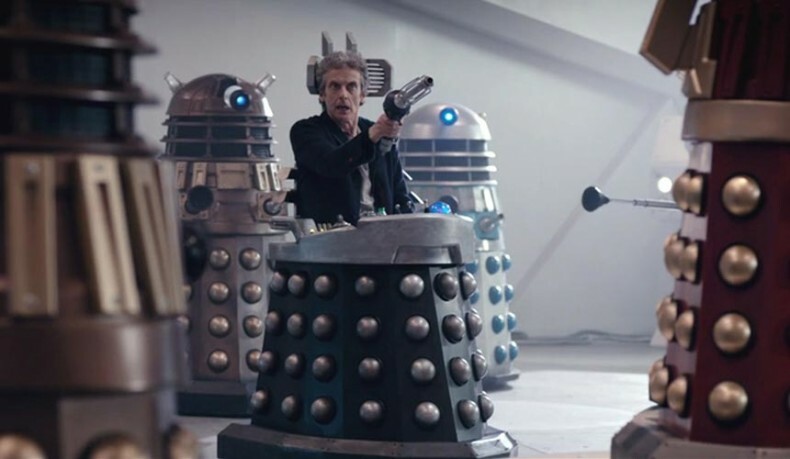 The sight of the Doctor riding around in Davros’s chair is amazing. The Dalek sewers are lifted straight out of The Curse Of Fatal Death but they provide a great resolution to the story when the ending comes. And what an ending! The Doctor shows Clara that he’s upgraded from a sonic screwdriver to sonic sunglasses and makes the TARDIS recombine with them around him and Clara. As the Daleks shoot, the pair makes a triumphant getaway. It’s a proper punch-the-air moment if I ever saw one. That’s what this story is in essence, a triumphant return for Doctor Who after an almost-unbearably long break. While not perfect I still think this story comes very very close to it. I would even go so far as to say that while it’s not my favourite (Listen takes that prize) The Magician’s Apprentice / The Witch’s Familiar claims the number two position. We were promised an explosive opener to series nine and that’s exactly what Moffat delivered.